This is a deeply disturbing book.. It is the true story of the Oyler family who's oldest son, Ben, a hemophilic. Ben was diagnosed in 1985 with AIDS, contracted from a blood infusion. He had been given at least two dozen transfusions of highly concentrated factor a year and each transfusion contained the blood of at least two thousand donors.. That meant Ben had been exposed to the blood of more than 48,000 people since he had been born.. One, or more of them, had AIDS.. Ben could have been exposed to the virus some time prior and it had just been dormant until then, since the factor had been heat treated only for two years and Ben was seven, he could have been exposed as a baby..given Factor V11 (clotting factor) for bleeding The book is about that traumatic year, their struggle with his eventual death - a little over a year after his diagnosis.. Their other 2 sons also had hemophilia.. and the Mother is PG with another child.. The toll it takes on their marriage, the family, their faith.. (They are LDS) . The ravages of the disease in 1985, when no one survived AIDS..What a sad and horrible story.. But.. as the title suggests.. They believe in going toward the light and that they will be together again in heaven. This book may be difficult to find. I read it over twenty years ago but it's affect has stayed with me. It is the true story of how a family copes with the impending death of their young son, Ben. The way the mother helps her son come to terms with where he is going after death taught me so much about strength and faith. The courage and grace that Ben displays as he deals with his illness moved me. The love demonstrated by the entire family was inspiring. This book left footprints on my heart. I often cry when moved by writing. However, this was the only book I have ever read where I had to have someone read aloud the last chapter. I literally couldn't read it because I couldn't see through my tears. I just sobbed. I hope people will have the courage to read it. It was well worth the tears. i never cried, hoped and prayed so much while reading a book. till to the last page i prayed for a miracle to happen so ben could be safed. reading this book it was inevitable to develop a strong sympathy for the family. A story of a mother and the family coping with the upcoming death of their son. Powerful book. A must read. It's been 31+ years since Chris Oyler's son Ben died from AIDS related complications. The thing of it is though, regardless of what any 'CHILD' dies from, it's inevitably a parents WORST waking nightmare.The one saving grace for the Oyler family seemed to be that despite how their young son's physical body was slowly 'shrinking' away from them, they got to witness how very much his young soul grew by leaps and bounds. Their 'hearts' were able to 'take a picture' of that. It helped sustain them through those very difficult months from his diagnosis until his passing.A thought-provoking, heart wrenching story told in the most simplest of words, as only a mother could think to convey. I would gather that it was a form of therapy for Chris Oyler to write down all of those whirlwind of emotions that she and her husband and extended family went through during the last year of their young son's life. A year filed with so much pain and agony(both physical and emotional). Oddly enough though through all of that misery she and her young family got something that they needed. Something they needed more than anything. TIME. Time to learn from their young son how to be brave, how to make the best times of their lives out of their darkest days. They were all given just enough time to see their spiritual sides grow. They took every little odd piece of time and every tiny bright moment they could find and tried to make something beautiful out of it all. For so many of us it's quite difficult to find the beauty ahead of us while we're in the darkness.It struck me about half way through this book that we as humans are always doing what we can to make our living worthwhile in whichever way we see fit BUT there's no way that all of that 'living' can ever prepare any of us for dying. Not really. Right?!? There's a recognition of sorts, that in order to gain something, we often have to give up something even greater than what we gained.This was a beautiful book about a very sad story. I'll be honest and say that there were perpetual tears for the last 40 of the 246 pages. It was well worth the tears I might add. Indeed, not a very long book to cover the last year of someone's life but the thing is, a person's life, regardless of how short lived it is, will always live on in the hearts and minds of those who loved that LIFE long after the physical body is gone. All that energy and love cannot vanish without a trace. I have to say, the love demonstrated by this entire family was inspiring. So many difficult but beautiful lessons during this journey for this family. Lessons full of faith and hope. I could only ever hope to approach any challenges that my family may encounter just as valiantly. 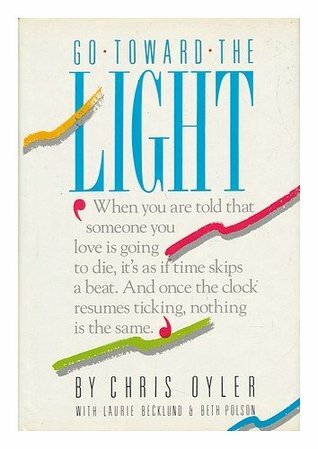 I would imagine back in the day when AIDS first came into the light, that a book like this could have helped make people better understand it and what it was all about. Maybe even help them to understand the human side to it which was especially ignored. All in all, I thought this book, written by an average American Mom just trying to come to terms with having lost a son so tragically to an awful disease, was amazingly well done. Despite the outpouring of all of the darkest moments during most of the book, by the time Ben was Go(ing) Towards The Light, Chris Oyler manage to perfectly guide us through that agonizing part of her life. She managed to give me, the reader, closure ... even when it seems time skips a beat, once the clock resumes ticking ... those left behind go on living ... but nothing is ever really the same again. I read this book more than 25 years ago. It is a story that has stayed with me. I thought it was well written and I remember having tears stream down my face as I read it. This book is one I will never forget. I have it if anyone wants to borrow it. "There's a word for a woman whose husband has died: widow. Why, I wonder, isn't there a term for a woman whose child has died? I suppose because you never stop being a mother... even when your child is gone. You carried that child inside you, and you participated in the miracle of life when that child was born. And you know that all that energy and love cannot vanish without a trace." The is the best, heart touching, tear jerking book I have ever read. I reread it periodically and it never fails to move me. What would you do if you knew your child were going to die? The Oyler family, who had three sons with hemophilia, had to face that very decision when their oldest son, Ben was diagnosed with AIDS, contracted as a result of some infected factor he received at some point in his short life. Through Ben's illnesses and hospitalizations, and trying to still provide for and raise a young family, the Oylers learned how to cope with so many difficult questions: how do we tell our son he's going to die? How do we prepare our other children for a life without their brother? How do we let our son go? With faith and love, the Oylers learn some difficult but beautiful lessons during their journey. This true story is heart-wrenching but full of faith and hope. I only hope I can approach the challenges in my life just as valiantly. This is the third book I've read in just a few months that deal with death and the life after this one. It's been a wonderful and beautiful learning experience for me. I was perhaps 12 or 13 when I read this book, in a version of The Reader's Digest (in the Netherlands). I couldn't stop crying, not even after rereading it and I often did. I never forgot this story. It was the early '90s. Aids was just beginning to become less taboo as a topic in society. More knowledge about this disease was becoming available. This book helped making people understand it better, the human side to it which was especially ignored. There was one sentence which really touched me, but I forgot the exact quote. It was about enjoying the good days and hoping for better ones during the bad days. One of my all time favorites! It is the true story of Ben, a seven year old boy with hemophilia, who contracts aids through a blood infusion. All this happens when aids was still new, and not much was known about it. It is written by Ben's mother, and tells how Ben and his family dealt with his diagnosis from the begining to the end. It is extremely touching, and will have you laughing one minute, and reaching for the tissues the next. I cried and cried through this book...the story of a mom losing her first born son. It was beautifully written though, and good to see how both she and her family survived and thrived through one of the most difficult things--the loss of a child. I really enjoyed this book. This book is about a little boy who got Aids through a blood transfusion in the early 80's. His mother wrote about their story and the family struggles are sad, beautiful, and inspiring. They actually made it into a TV movie. An easy read...but lessons for all are in this book. This book is the memoir of a mother whose child died of AIDS (which he got through a blood transfusion). Very heartfelt, touching book. However, I read this a long time ago. I may not like it as much anymore today, but from what I remember it was pretty good. When I first read this book I really loved it (4 stars). I tried to reread it to see if I still enjoyed it but unfortunately I could not finish it and I stopped early on. I will lower the rating to 3 stars and leave it as read. The actual story of our Bishop's family . . incredible. Heart-breaking and heart-warming. I've read this book at least 5 times. I love it. It's a mother's story about her 8 year old son who is diagnosed with AIDS and how she and her family cope with his dieing. This book was recommended by my friend who had known this family. It was very inspirational how they drew closer to God and each other as they went down the road of losing a child. Cried until my eyes were swollen shut. This is definitely a book that I sobbed over. I briefly met the author, since I was good friends with her nephew. The story is a combination of heart-breaking and inspiring to overcome trials. this is truly a heartbreaking story. i have read this for like, twenty or so times and it never fails to make me cry. Later on, I watch the lifetime television movie about this family dealing with HIV. I like the book so much better. I've read this book when I was still in College. Made me cry. Of course this book has a special place in my heart! I cried through the reading of this book. A sad but beautifully written book.